Grown as a tender perennial in frost-free areas, and an annual herb elsewhere. 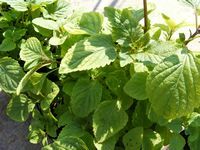 Can grow up to 30 to 90cm with bright green leaves that are similar in scent and flavor to lemon verbena and lemongrass. Prefers moist soil in sun. Young leaves and stems - delicious in tea drinks. Compliments noodles, fish, chicken, salads and soups. Treats common colds, fevers, headaches, diarrhea, edema and oliguria. Relieves the effects of excess alcohol.